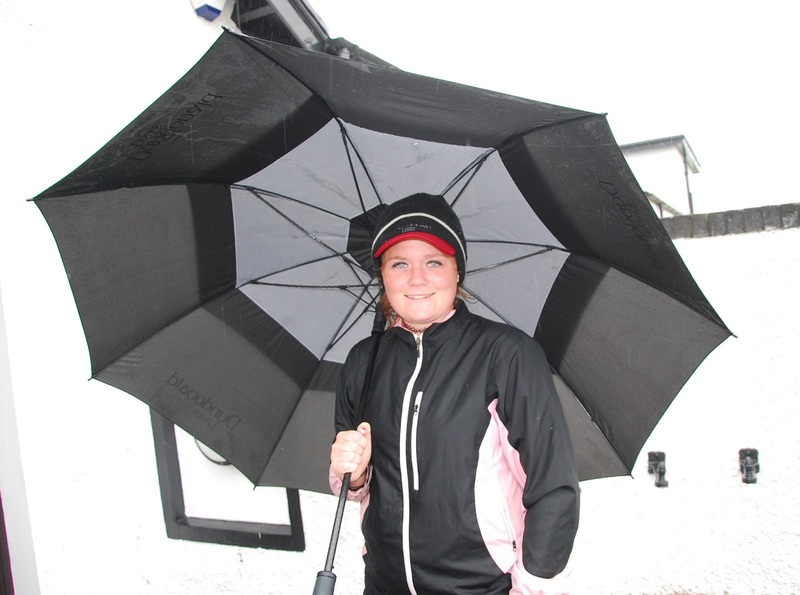 Stirling student Chloe Goadby (St Regulus Ladies), pictured right, and Emma Hale (Royal Troon), pictured below with an umbrella, headed a field of 70 players at the end of one of the wettest first days in living memory at the 103rd Scottish women's amateur golf championship at the mist-shrouded Royal Aberdeen Golf Club links. It was raining when play started at 8.30am and it still had not stopped when play finished in the first qualifying round at 5.30pm. Across the River Don at the King's Links, flooded fairways and greens ruled out Pennant League matches but the Balgowie links coped splendidly with the steady downpour. The greenkeeping staff, with some help from such worthies as Scottish Golf head of events Fraser Munro from Kinross and rules referee Liz Munro from Lossiemouth - "I've never worn Wellington Boots on a golf course before!," squeejeed away what excess water there was to be seen, particularly at the sixth and eighth greens. Not surprisingly, in such unpleasant conditions, no one managed to equal the par of 76 over a course of just over 6,000yd. 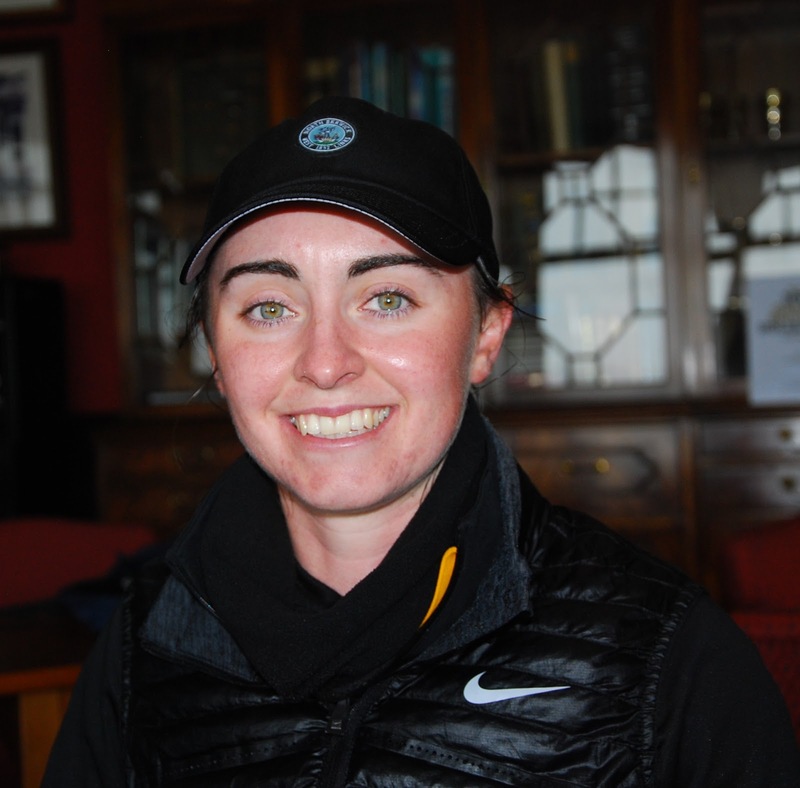 Goadby, 19, set the clubhouse target of one-over 77 before lunchtime and it was only near the end of play that she was joined in the lead by 20-year-old Hale. Seventeen-year-old Shannon McWilliam (Aboyne), Jennifer Saxton (Muckhart) and Royal Montrose's Gillian Paton are sharing third place on 78. At the end of the second qualifying round, the leading 32 players will advance to the championship's match-play stages, the final of which is on Saturday. The next 16 available on the leaderboard will contest the Clark Rosebowl match-play competition. St Rule Trophy winner at St Andrews on Sunday, Clara Young (North Berwick), the 2015 Scottish champion at Monifieth, had four double bogeys in compiling a nine-over 85 (42-43). She is pictured on the right in the Royal Aberdeen clubhouse. She said: "I've played in some terrible conditions. This was by no means the worst but I have not played all 18 holes in such steady rain, that I can remember. 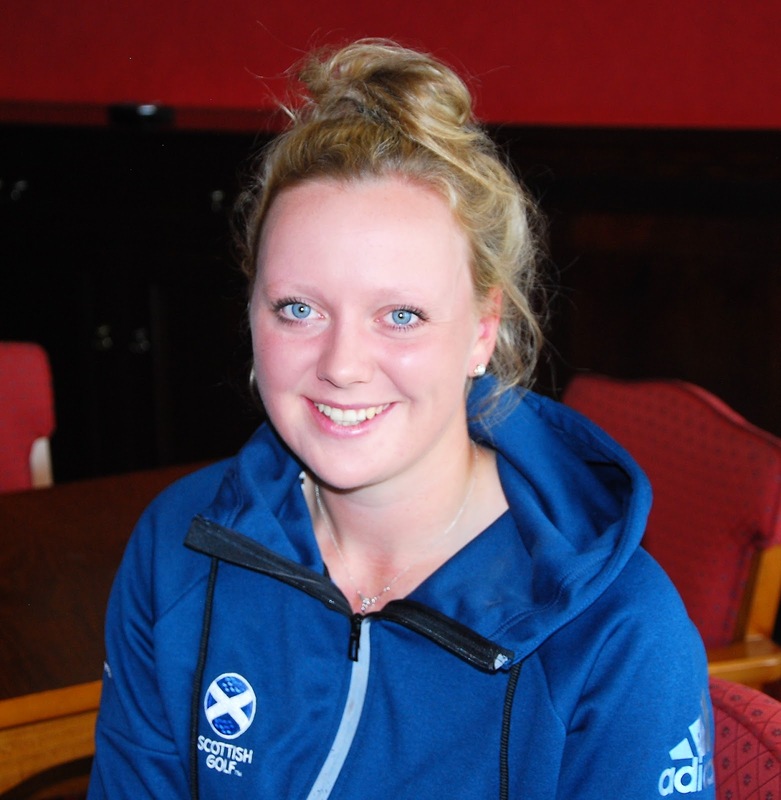 Defending champion Ailsa Summers (Carnoustie Ladies) had an 84 with equal halves of 42. She had three 7s on her scorecard, one a triple bogey at the 16th and the others double bogeys at the par 5 sixth and 12th. But Summers could also claim to have notched the only eagle of the day - a 3 at the par-5 18th. Chloe Goadby has been playing well for weeks and is a firm believer that practice makes perfect. "I've tried to get my game to peak for the St Rule this past weekend and this week's championship at Balgownie," she said. "I dropped shots at the second and third but reminded myself that the first two days are all about making the top 32 for the match-play stages so there was no sense at all in letting the head go down. "I parred the next six holes and that settled me. I birdid the 12th, 14th, 17th and 18th to come home in one-under 36 for a 77. so I am pleased about that." Emma Hale, rather modestly, says she has never shared the lead in a tournament of the status of the "Scottish." "In fact, I've never won anything of note at all!" Her 77 (41-36) figured birdie 4s at the long first, 14th and 18th. 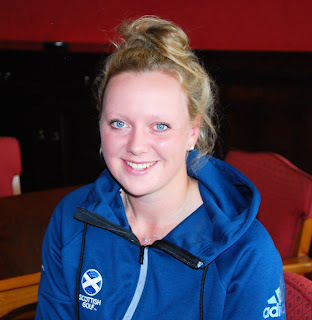 "The greens were quite slow with all the rain but the ball rolled well on them and I did not three putt at all," said Emma who played for the Scotland U18 girls team when she was a junior. Angus county champion Gillian Paton (Royal Montrose) finished with a 78 for joint third place overnight. Needing to par the last three holes for a 76 to lead, Gillian bogeyed the 16th and 17th to take two-over 39 for the inward half. It was much the same story for Monifieth's Heather Munro, pictured right. Despite double bogeys at the second and sixth, she was in a good position coming up the finishing holes, having birdied the short eighth, 13th and 14th. But Heather dropped five shots to par over the last four holes and a potential 76 or 77 became a what-might-have been 82. She had a double bogey 6 at the 15th, a par at the 16th, a bogey at the short 17th and a double bogey 7 at the 18th . Tara Mactaggart (Minto) ran up a triple bogey 7 at the 13th but responded with birdie 4s at the 14th and 18th, dropping a shot at the 16th in 39 home for a 79. 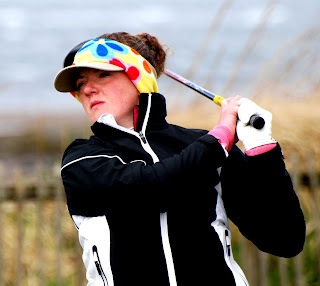 Scottish U18 girls champion in 2013 and later a beaten finalist in this championship, Connie Jaffrey (Troon Ladies), pictured left, had a nightmare outward half - for a player of her calibre - of seven-over 46, having started with a double bogey 7 and then bogeyed the third, sixth and ninth with a second double bogey, a 6 at the seventh, tucked in there as well. Her woes continued with successive bogeys at the 11`th, 12th and 13th, but she did birdied the par5 14th and short 17th although she did have a fourth bogey on the way home, at the 17th. 09.30 H Bycroft, C Macdonald. 09.40 L Terry, E Logie, A Ford. 09.50 S Robertson, M Stewart, C Johnstone. 10.00 J Linklater, E Kennedy, J Taylor. 10.10 M Adam, M Finnie, C M Boa. 10.20 G McGinlay, M McInnes, R Hunter. 10.30 J Grubb, E Docherty, K Blackwood. 10.40 C Wilson, S Stichbury, L Wilson. 11.00 W Nicholson, S Cameron, L Fraser. 11.10 A Bartlett, F De Vries, P Wilson. 11.20 S Leslie, L McClymont, C Thompson. 11.50 M Gardner, M Robb E Moffat. 12.10 C Young, M Sievwright, C Jaffrey. 12.20 G MacDonald, A Summers, A McKay. 12.30 K Ferguson-Snedden, Susan Wood, K Marshall. 12.40 J Cameron, H McCook, H Munro. 12.50 C Taylor, E Watson, J Farrell. 13.00 K Wright, J Rankine, L Duncan. 13.10 T Mactaggart, G Paton, S McWilliam. 13.20 J Saxton, E Hale, C Goadby.